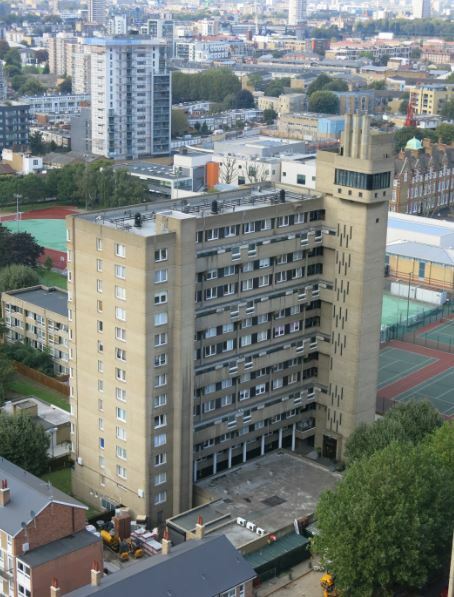 Following a recent post on Balfron Tower, I sent a slightly snarky tweet to National Trust London. 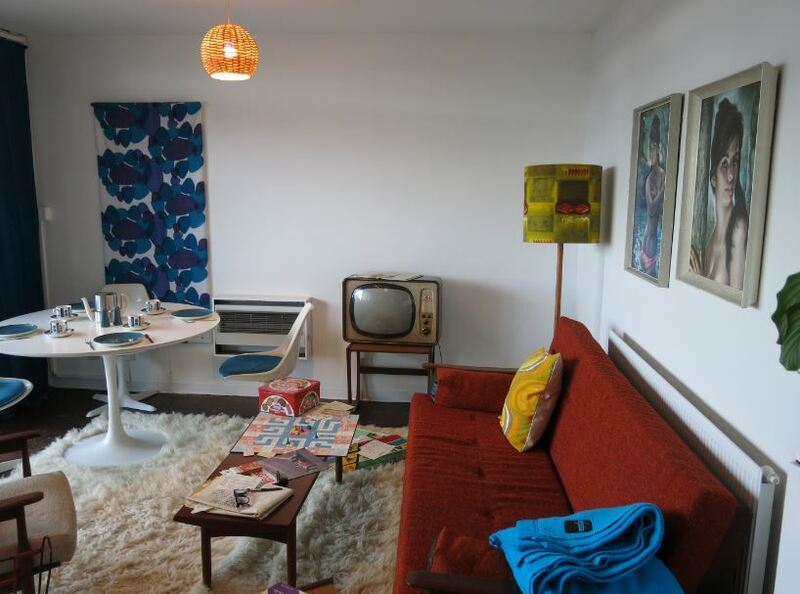 The National Trust were offering guided tours of Balfron, climaxing in a visit to Flat 130 – the temporary home of Ernő and Ursula Goldfinger for two months in 1968. 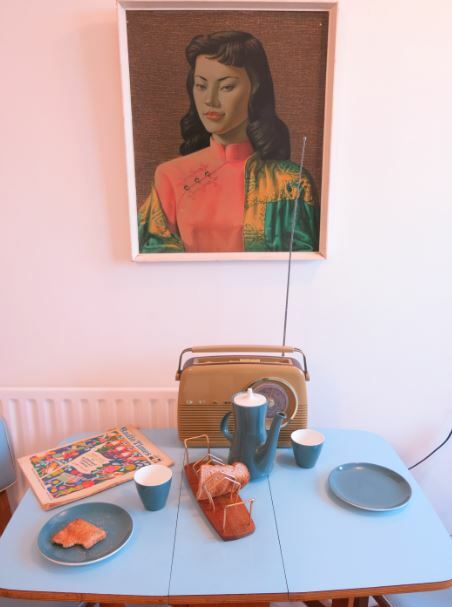 I’d visited the Tower during London Open House myself a couple of weeks earlier and had viewed the various studios and installations of artists temporarily resident in the block before its refurbishment and sell-off to the private sector. It was hard not to see a total process here – nothing that could be viewed as ‘regeneration’ except in its most attenuated and twisted form, rather something more akin to burial: a long good-bye to social housing dreams and aspirations, sugar-coated as is the British way with that cost-nothing deference the ruling classes give to their vanquished foes. And a dialogue and invitation ensued to attend the Balfron tour. Last Friday, I went along. 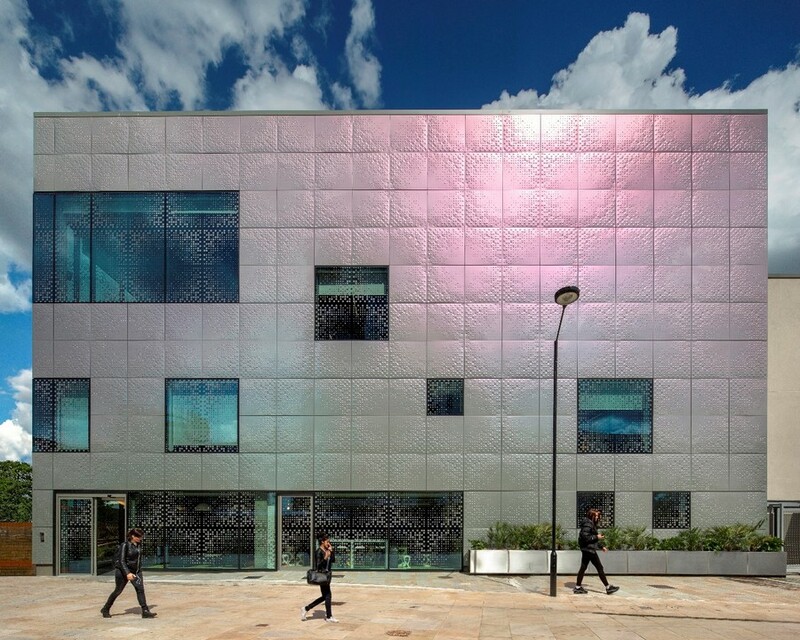 We started at the Spotlight Café – not, in its own words, ‘a youth club, or a youth centre’ but ‘a multi-million pound creative youth space designed to inspire’. It’s managed by local housing association Poplar HARCA and funded by LandAid (‘the property industry charity’), British Land and the Canary Wharf Group – a £7m project designed by Astudio ‘to provide users with opportunity for leisure and skills development, helping to empower and galvanise the local community’. I forgot to take a picture. This is an architect’s image of the design which is actually pretty close to the reality. It’s an interesting building and it has to be a good thing, doesn’t it? It provides local youngsters with activities and facilities they want and, if that depends on a lot of ostentatious Corporate Social Responsibility and comes with all the market-driven jargon of ‘skills and opportunities’ and visual paraphernalia of post-modern design, so be it. But it’s worth studying as a building of its time, perhaps as representative of a nexus of social and economic relationships as Toynbee Hall, say, in Whitechapel not far away. Nowadays, we don’t ‘improve’ people, we ‘empower’ them but the more cynical among you might see a persistent and essential hierarchy in place. Those observations were, not unreasonably, beyond the remit of our guide but he did mark the place – Poplar – and its place – Poplarism – in another history: a time when local councillors went to prison to defend working-class conditions and we believed change would come from below, through struggle, rather than through corporate benevolence or the generosity of the market. 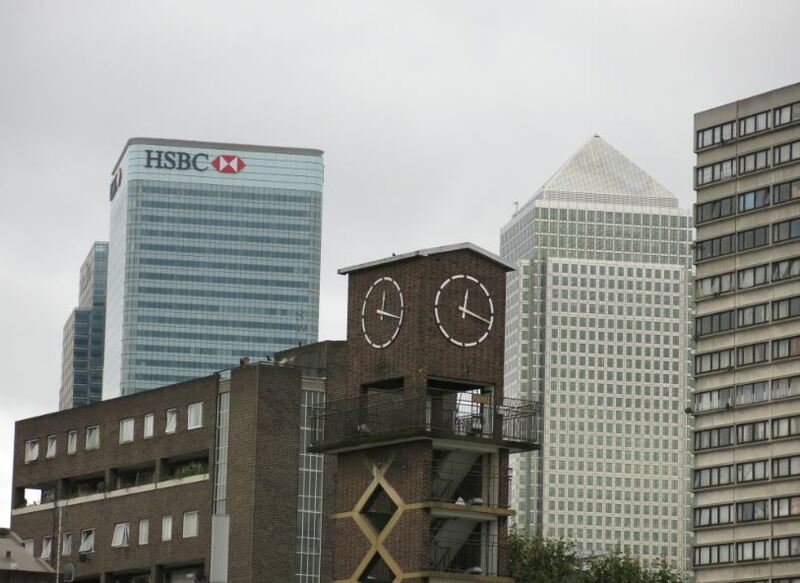 Frederick Gibberd’s clock tower in Chrisp Street market with its backdrop, Canary Wharf. Fitzgerald House, a 1968 council block, is to the right. We moved on to the Chrisp Street Market and the Lansbury Estate, the Festival of Britain’s 1951 model housing estate, named after the leader of that earlier revolt, George Lansbury, and built to meet the ‘needs of the people’. All this was well-noted. The guide commented on the modesty of the architecture – rightly, of course, particularly with Balfron coming up as its antithesis – but I’d love people to appreciate the ambition of this moment and its drama. We believed then in the possibility of collectively building a better world. We no longer do. Even the language would embarrass most contemporary politicians. Next we walked through the Brownfield Estate: for Owen Hatherley ‘still remarkable as an example of a time when public housing could be valued as much, or rather more, than any other form of building’. The low-rise, designed by the Goldfinger team, is unassuming but it’s carefully crafted and well-constructed. 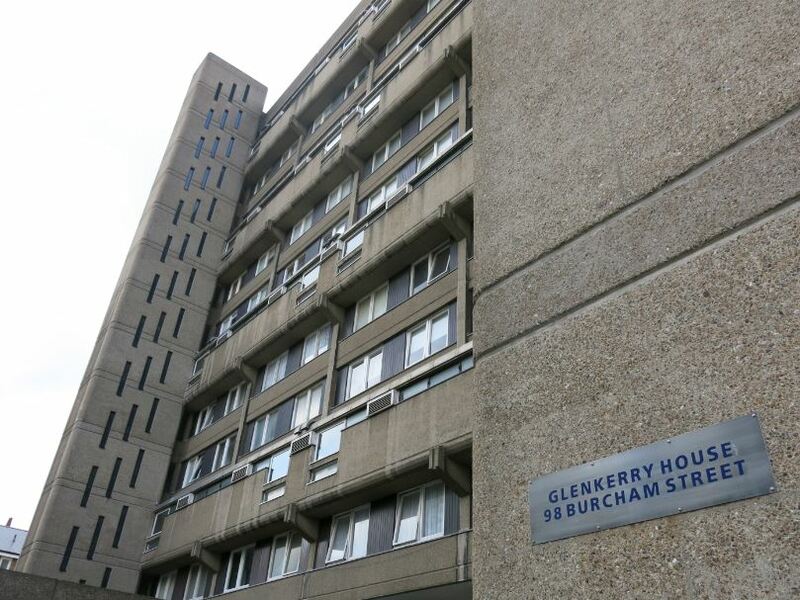 We noted, as we walked past, Goldfinger’s Glenkerry House –a Brutalist building which can bear the adjective proudly though Goldfinger himself disliked the term. 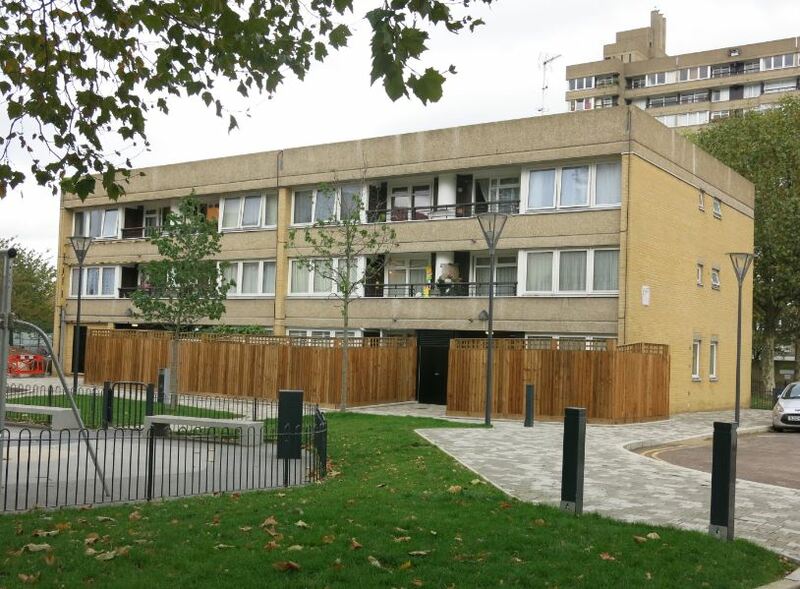 Its 75 flats and four maisonettes have been owned and managed by residents through the Glenkerry Cooperative Housing Association since its construction. It would be interesting to have learnt more about why the GLC chose this model here and what its wider lessons might be. 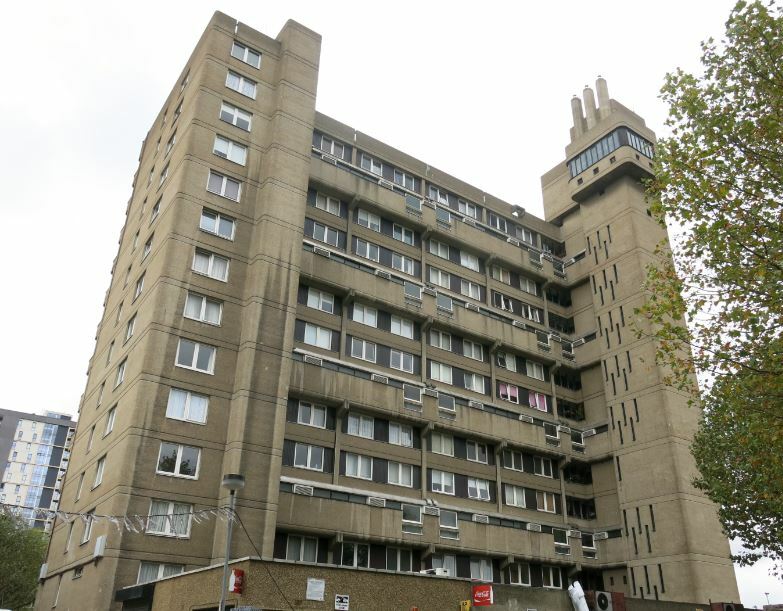 Next, after looking at Carradale House, the third of Goldfinger’s Brownfield designs, on to the main show – Balfron Tower itself, accessed through the basement and then up the surprisingly quick but disturbingly coffin-shaped lift to the twenty-third floor. Flat 130 has been re-created by Hemingway Design in sixties’ style. It’s great fun, certainly the most purely enjoyable part of the tour and a beautiful exercise in nostalgia. 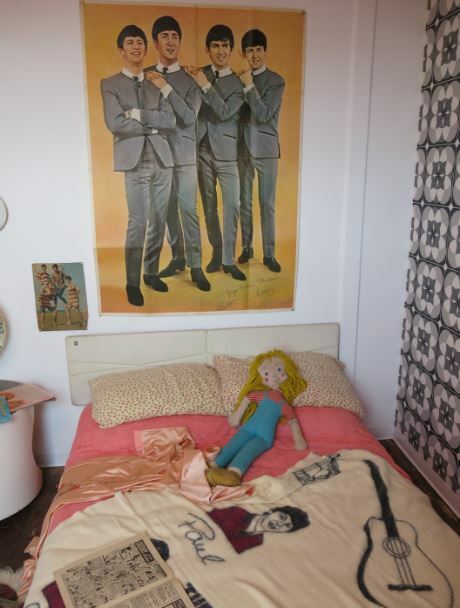 But it felt to me too much like pastiche – a set of sixties’ clichés and probably not (as the guide pointed out) the décor or furnishings that most of the new residents would have possessed. There’s a telling misstep here, I think. The National Trust invites us to study an image of the sixties – a rather hip image of a hip sixties as contemporary hipsterdom might view it. We are safely removed from the reality of Balfron’s actual residents at this time – we don’t need to engage with real people moving from the slums; we can forget it is (or rather was) a council flat in a council block. And we are invited – at the very least, allowed – to forget that this particular bit of council housing is being sold off to rich people. The resident artists, the Balfron Arts Season and National Trust tours are, at minimum, complicit in this; at worst, they are its agents. Now, to be fair to the National Trust, they come to this late in the day and they’re hardly to blame for Balfron’s demise. The guides were well-informed and interesting, good on the architecture and sensitive to much of the local history. The guidebook is generally excellent: well-written and illustrated with thoughtful coverage of major themes – Goldfinger himself, Brutalism and high-rise, some East End and social housing context. But the section on ‘Balfron Now’ pulls its punches. The ‘dynamic partnership’ of Poplar HARCA with the Bow Arts Trust is noted but its meaning is glossed over. Do middle-class artists (however much some were ‘harnessing local creativity into artistic interventions’) really contribute to the regeneration of social housing? Isn’t this really a process of gentrification? And the end-game of that process – the sell-off of the flats to those who can afford to buy them – isn’t mentioned. Like it or loathe it, this was intended to be heroic architecture that offered the best of design to the masses, freed people from condemned slum housing, and elevated them – literally – to a better life. 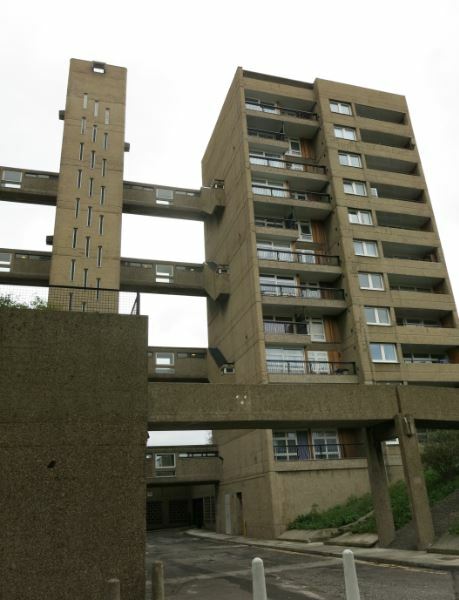 Balfron Tower is the welfare state in concrete. It deserves, nay demands, our attention. But if you mark that politics you have to note our politics – the politics that has seen social housing progressively marginalised and demonised, the politics that has allowed the welfare state to be chipped away and sold off. In short, we need to be told what maintained all that high art and beautiful ostentation and how the building fits into the politics of the day. 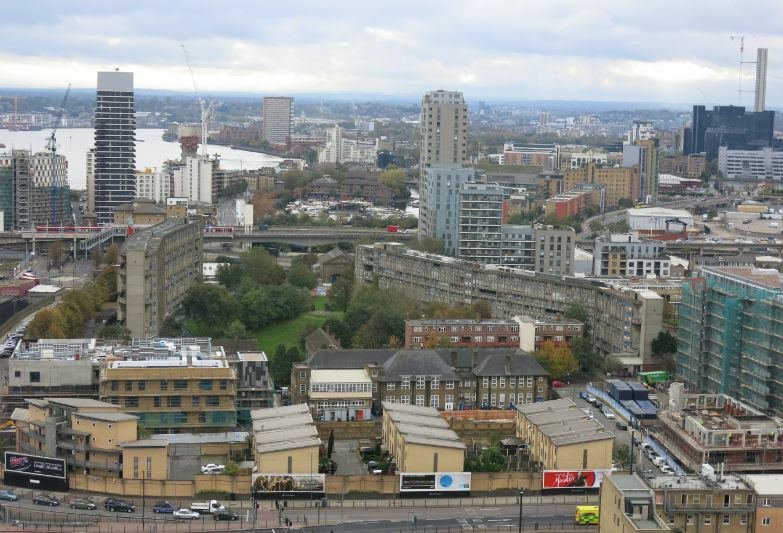 When we come to the more recent history of Balfron Tower, and the more so when the Trust has to its credit chosen to celebrate mass housing rather than that of the upper classes, our duty to examine the lived reality of ordinary lives and the politics which shapes it becomes even stronger. Who lived here? What changed? 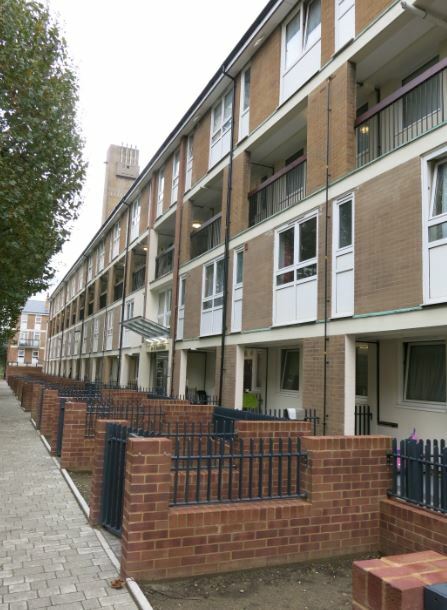 What’s happened to social housing, why is it being sold off? These are not incidentals to Balfron’s past and present but are central to them. Ignore those and we’re left with a sanitised ‘heritage’ which will please the architectural aesthetes but tell us very little of its true story. A superb combination of well researched historical fact and informed intelligent opinion. Thank you for a great article. Excellent, as always, “hitting”, “on”,”head” and “nail” spring to mind. I went on the tour several weeks ago. Enjoyed it immensely but this article sums up my own mixed feelings about what is happening at Balfron and elsewhere in London. Coming to this post very late, but very well argued and illustrated. Thank you. I could send you a note after every post thanking you. You are a beacon and some of us see you and share your frustration that too few want to talk about council housing. I led a walk around Lenton in Nottingham for a local history society in June. The sad truth is people, even oldies like myself, forget it significance, even that they grew up in a council house. Keep up the good work and I hope there will be a book based on Municipal Dreams before too long. Thank you very much and you’ve given me encouragement to work on the book. It certainly feels as if there’s a lot of interest and support out there for what the blog tries to do. I echo Robert’ Howard’s comments above. A book would be great. As far as I know there isn’t anything around on the subject and would love to see it.